The Jordan Museum serves as a comprehensive national centre for learning and knowledge that reflects Jordan’s history and culture. Designed by the late Jordanian architect Jafar Tukan, it was inaugurated in 2013. The Jordan Museum tells the ‘Story of Jordan’ both chronologically and thematically, utilizing graphics, over 2,000 artifacts on loan from the Department of Antiquities, and specially designed materials. 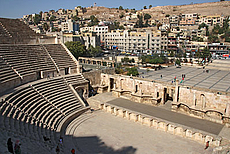 A part of the collection originates from the old Archaeological Museum on Amman's citadel. Ain Ghazal Statues, created 8700 - 8500 years ago, the earliest known large-scale human figures. The Nabataean exhibits, with information about the society and architecture of the inhabitants of the city of Petra. The Dead Sea Scrolls, among them the only one inscribed on a copper sheet. The tour through downtown reaches the Jordan Museum and Ras Al Ain urban complex.